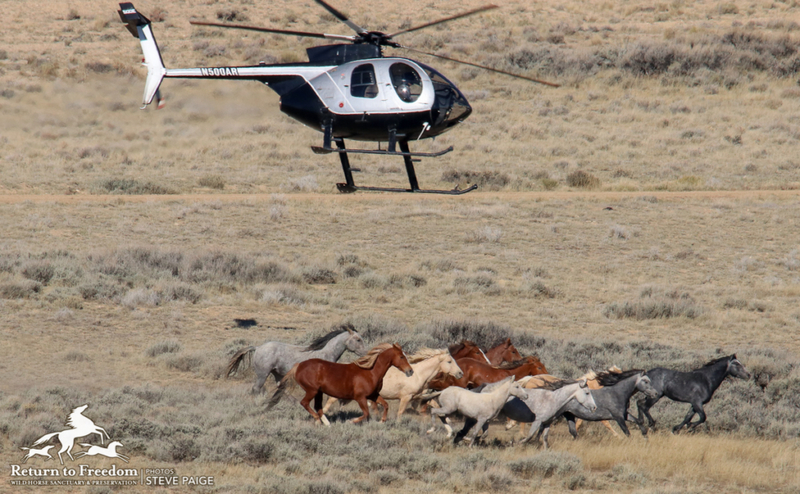 A contractor’s helicopter pursues wild horses in Wyoming earlier this fall. RTF file photo by Steve Paige. The Bureau of Land Management on Wednesday captured 96 wild horses during the first day of a helicopter roundup at the Fox and Lake Range Herd Management Area in Nevada. BLM reported no injuries among the 28 studs, 42 mares and 26 foals captured. The agency plans to permanently remove 200 wild horses from the herd management area south of Gerlach, Nevada. The Tohakum 2 wildfire burned about 27,000 acres of the 177,724-acre HMA before being brought under control in September. According to BLM, a number of wild horses have remained in the burned area, which contains two water sources. Their grazing would “hinder the success of fire rehabilitation efforts” and encourage the spread of invasive weeds, according to BLM. The HMA’s wild horse population was estimated at 530 wild horses in March, before the foaling season. The agency’s “appropriate management level” for the HMA is 122-204 wild horses. amount of forage needed to sustain one cow and her calf, one horse, or five sheep or goats for a month) on the two allotments, though ranchers with grazing permits there have voluntarily reduced their numbers in recent years and did not graze on the affected area from 2013-16, according to BLM. Captured wild horses will be taken to the Indian Lakes Wild Horse Off-Range Corral in Fallon, Nevada, where they will be readied for the agency’s wild horse adoption program, according to BLM. BLM is conducting the roundup under an emergency decision. To view planning documents, click here. Members of the public who wish to view the roundup should call Jason Lutterman at (202) 304-0967 prior to the desired viewing date to be added to the attendee list and receive further instructions. Participants will meet at the Love’s Gas Station, 825 Commerce Center Drive in Fernley, Nevada. Those who attend must provide their own transportation — four-wheel drive vehicles are strongly recommended — as well as their own food and water. Bathrooms are not available at the trap site. Those who attend should wear shoes and clothing suitable for harsh conditions.